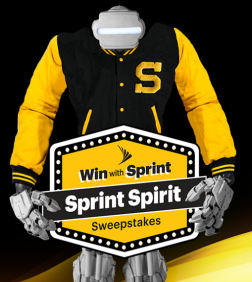 Sprint Spirit Sweepstakes & IWG – Win a trip for 4 anywhere in the US & more! Win a trip for 4 anywhere in the US, $5,000 in Amazon gift cards, a Samsung Notebook 9 laptop, a Galaxy tablet and a Samsung device! ENTER SWEEPSTAKES HERE – Sprint Sweepstakes page. ENTRY LIMIT – There is a limit of one (1) Sweepstakes entry per calendar day during the Promotion Period. ELIGIBILITY – This Promotion is offered only to legal residents of the fifty (50) United States and the District of Columbia, Puerto Rico and the U.S. Virgin Islands who are at least eighteen (18) years old at the time of entry. SWEEPSTAKES ENTRY PERIOD – The Promotion begins on August 10, 2018 at 12:00 AM Eastern Time (“ET”) and ends on September 13, 2018 at 11:59:59 PM ET. One year of Amazon Prime membership (awarded as an Amazon.com digital promo code) 50 $120. Bloomfield, MI 48325. Winners’ List requests must be received by November 13, 2018. 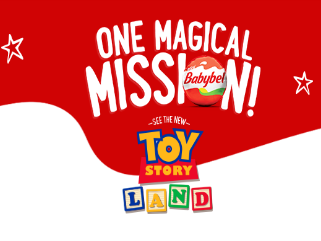 Babybel One Magical Mission Instant Win Game and Sweepstakes – Win a trip to Walt Disney World! ENTER SWEEPSTAKES HERE – Babybel Sweepstakes page. ENTRY LIMIT – There is a limit of one (1) Game Play and one (1) Sweepstakes entry per day during the Promotion Period. SWEEPSTAKES ENTRY PERIOD – The Promotion begins on July 1, 2018 at 12:00 PM (noon) Eastern Time (“ET”) and ends on September 30, 2018 at 11:59:59 PM ET. 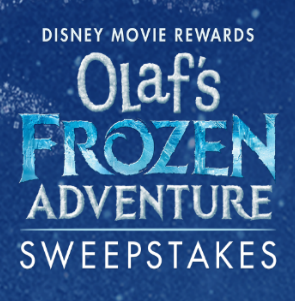 Walt Disney World® Resort (subject to restrictions); and  a $2,000 check made payable to Sweepstakes winner. All elements are collectively the “Sweepstakes Prize”). received by November 29, 2018. 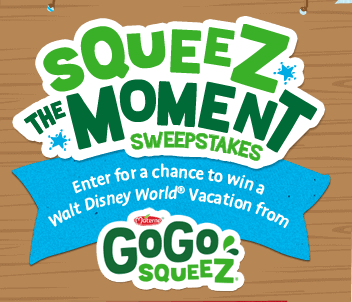 GoGo squeeZ® – squeeZ the Moment Sweepstakes – Win a trip to Walt Disney World! ENTRY LIMIT – Total limit of an Entry and Additional Entries results in four (4) entries per person, per day on the day of Registration and thereafter, a limit of three (3) Additional Entries per day, per person. SWEEPSTAKES ENTRY PERIOD – The Sweepstakes begins on or about 12:00:00 A.M. Eastern Time (“ET”) on 8/01/2018 and ends at 11:59:59 P.M. ET on 10/31/2018. WINNER’S LIST – For winner’s names (available after 11/9/2018), send a self-addressed, stamped, business size (#10) envelope by December 10, 2018 to: GoGo squeeZ® squeeZ the Moment Sweepstakes Winners’ List Request/Match MG, 800 Connecticut Avenue, 4th Floor East, Norwalk, CT 06854. 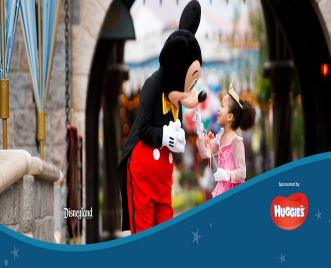 Huggies Magical Getaway Giveaway Sweepstakes & IWG – Win a trip to Disneyland! ENTER SWEEPSTAKES HERE – Huggies Sweepstakes page. ELIGIBILITY – Magical Getaway Giveaway is open only to legal residents of Alaska, Arkansas, Arizona, California, Colorado, Connecticut, District of Columbia, Delaware, Florida, Hawaii, Idaho, Illinois, Indiana, Iowa, Louisiana, Maine, Maryland, Massachusetts, Montana, Nebraska, New Hampshire, New Jersey, New Mexico, New York, Nevada, North Dakota, Oregon, Pennsylvania, Rhode Island, South Dakota, Texas, Utah, Virginia, Washington and Wyoming who are at least eighteen (18) years old at the time of entry and entries originating from any other jurisdiction are not eligible for entry. SWEEPSTAKES ENTRY PERIOD – The Promotion begins on July 1, 2018 at 12:00 a.m. Eastern Time (“ET”) and ends on July 28, 2018 at 11:59 p.m. ET. PRIZES – Sweepstakes Prize: ONE (1) GRAND PRIZE: The Grand Prize winner will receive a 3-Day/2-Night vacation package for themselves and up to three (3) guests to the Disneyland® Resort in Anaheim, California (“Resort”) consisting of: (i) up to four (4) round-trip, coach-class airfares for the Group from a major airport nearest the winner’s residence (“Departure Airport”) to a Southern California area airport (“Arrival Airport”) (as determined by Sponsor in its sole discretion, including possible layovers, provided, however, if winner resides within two hundred fifty (250) miles of the Resort, air transportation will not be provided); (ii) up to four (4) round-trip ground transfers for the Group between the Arrival Airport and the Resort (as determined by Sponsor in its sole discretion, provided, however, if winner resides within two hundred fifty (250) miles of the Resort, ground transfers will not be provided); (iii) two (2) consecutive nights’ accommodations in a Disneyland® Resort Standard Room for the Group (quad occupancy) as determined by Sponsor in its sole discretion (subject to availability); (iv) up to four (4) 3-Day, Park Hopper passes for admission to Disneyland® Park and Disney California Adventure® Park (subject to restrictions); (v) a VIP Tour Guide for up to eight (8) consecutive hours on one (1) day during the Vacation Package (guide, services and hours to be determined by Sponsor); and (vi) one (1) $500 Disney Gift Card for the winner only (subject to restrictions). Travel/lodging for the Vacation Package must be completed by July 28, 2019. The Approximate Retail Value (“ARV”) of the Vacation Package is Eleven Thousand Nine Hundred Sixty Eight Dollars ($11,968.00). Instant Win Game Prizes: TEN (10) FIRST PRIZES: $100 Disney Gift Card. ARV: $100. THIRD PRIZES: Disney stickers. ARV: $2.50. 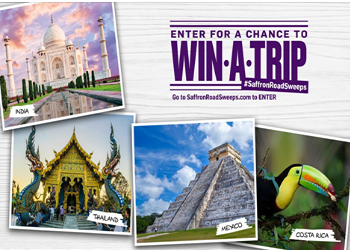 Saffron Road Trip Sweepstakes – Win an exotic trip! Win a trip of your choice: chose either – India, Thailand, Mexico or Costa Rica! ENTER SWEEPSTAKES HERE – Saffron Road Sweepstakes page. There is a total limit of five (5) Entries per person during the Sweepstakes Period. ELIGIBILITY – The Sweepstakes is open only to permanent legal residents of the fifty (50) United States and the District of Columbia who are at least eighteen (18) years of age or older and the age of majority in their state of primary residence at the time of entry. SWEEPSTAKES ENTRY PERIOD – The “Saffron Road Trip Sweepstakes” begins at 12:00 a.m. Eastern Time (“ET”) on January 18, 2018 and ends at 11:59 p.m. ET on March 31, 2018. 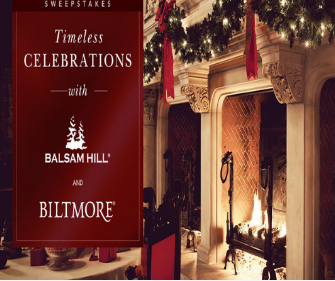 Timeless Celebrations with Balsam Hill and Biltmore 2017 Sweepstakes – Win a trip to Biltmore & Balsam Hill decorations! Win a trip for 4 to Biltmore in Asheville, N.C., a Balsam Hill Christmas tree and decorations! ENTRY LIMIT – Entries received from any person or e-mail address in excess of the stated limitation (30 entries) will be void. ELIGIBILITY – This Sweepstakes is open only to those who are legal residents of, and located within, the fifty (50) United States at the time of entry. All participants must have a valid driver’s license or photo I.D. Participants must be at least eighteen (18) years old at the time of entry. SWEEPSTAKES ENTRY PERIOD – The Timeless Celebrations with Balsam Hill and Biltmore (“Sweepstakes”) entry submission begins at 7:00 a.m. PST on December 25, 2017 and ends 11:59 PM. PST on January 8, 2017.
d. one (1) Balsam Hill Royal Celebration Ornament Set (approximate retail value of USD199.00). The winner must travel within the dates determined by the Sponsor in its sole discretion or the prize will be forfeited. Travel must be round trip . If the winner chooses to redeem this prize for less than four people, the difference in value will not be rewarded. Travel will only be valid in 2018. Total approximate retail value of the prizes collectively is $4,348.80. 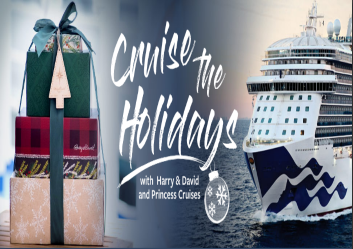 Harry & David’s Cruise the Holidays Sweepstakes – Win a $2,500 Princess Cruises® voucher! Win a $2,500.00 Princess Cruises® voucher! ENTRY LIMIT – There is a limit of one (1) entry per person per day during the Sweepstakes Period. ELIGIBILITY – Harry & David’s Cruise the Holidays Sweepstakes is open only to legal residents of the fifty (50) United States and the District of Columbia who are at least twenty-one (21) years old at time of entry. SWEEPSTAKES ENTRY PERIOD – The Sweepstakes begins at 12:01 a.m. (Pacific Time) on November 15, 2017 and ends at 11:59 p.m. (Pacific Time) on December 12, 2017. PRIZES – one (1) Grand Prize winner will receive a $2,500.00 Princess Cruises® voucher valid for one year from issuance on cruises leaving from a port in the contiguous U.S. for up to two (2) people. Two (2) runner-up winners will each receive a $500.00 Harry & David gift card. Grand Prize winner will receive his/her prize via email from Princess Cruises. The Harry & David® gift cards will be shipped by standard ground delivery to a delivery address provided by the runner-up winners. Winners may waive their right to receive the prize, but will not receive an alternate prize or any cash value. Prizes are not assignable or transferable and are not redeemable for cash. Sponsor reserves the right to substitute a prize of equal or greater value. Winners are responsible for reporting and payment of any taxes on their prize. Odds of winning depend on the number of eligible entries received during the Sweepstakes Period. Vouchers are subject to terms, conditions, and restrictions as set by issuer. APPROXIMATE RETAIL VALUE (ARV) OF PRIZES: The ARV for the Princess Cruises® voucher is USD$2,500.00, plus shipping and processing (which is not reflected in the ARV). The ARV for each Harry & David gift card is USD$500.00, plus shipping and processing. The ARV of all prizes is USD$3,500.00, plus shipping and processing. Shipping and processing are not reflected in the ARV. 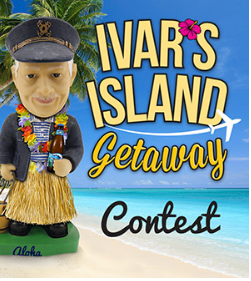 Ivar’s Island Getaway Sweepstakes – Win a trip to Hawaii! ENTER SWEEPSTAKES HERE – Ivar’s Sweepstakes page. ENTRY LIMIT – Limit one entry per person through the duration of the contest and promotional period. ELIGIBILITY – The Sweepstakes is open only to legal residents of the state of Washington who are 21 years of age or older at the time of entry. 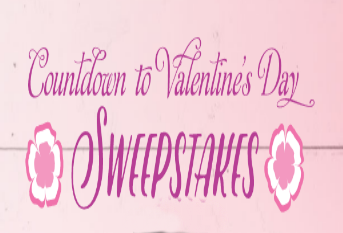 SWEEPSTAKES ENTRY PERIOD – The Sweepstakes Period starts January 25, 2017 at 9:00 a.m. Pacific Time (PT) and ends March 12, 2017 at 11:59 p.m. PT. PRIZES – One (1) Grand Prize winners will receive: Four vouchers good for tickets for roundtrip coach-class travel to Maui (Kahului) on Alaska Airlines, a six-night stay at Hyatt Regency Maui Resort and Spa, $200 Ivar’s Gift Card, four tickets to Ivar’s Acres of Clams Luau event on March 16, 2017 (ARV: $6,000). Twice-Weekly Prize winners will receive the following: a pair (2) of tickets to attend special Luau at Ivar’s Acres of Clams on March 16, 2017 (ARV $100) and at least one other item including: AAA Washington Classic Membership (ARV $56), bag(s) of Keala’s Hawaiian Blend Coffee (ARV $114), select cake from Cakes of Paradise (ARV $38), Sparkling Ice Blue Tooth Speaker (ARV $15), gift card for fresh, leis from Hawaii General Store (ARV $35). The Sponsor reserves the right to change or add weekly prizes.